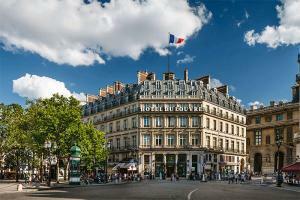 This magnificent hotel offers plush accommodations and impeccable service in the heart of Paris. Elegantly appointed guest rooms offer breathtaking views of the most famous Parisian landmarks. The hotel offers a wide range of services to cater to the needs discerning travelers to ensure an unforgettable stay in the City of Light. Located between the Louvre Museum, the Opéra Garnier and the Palais Royal in the heart of Paris. Place Vendôme, Place de la Concorde, the Marais neighborhood, the Tuileries Garden, the major department stores and Notre-Dame Cathedral are a few steps away. The hotel is approximately 45 minutes from the Charles de Gaulle airport. Brasserie du Louvre, Le Bar. Louvre Museum, Carrousel du Louvre, Jardin des Tuileries, Eiffel Tower.